The Mill House Inn used to be on Leicester Road, abutting what are now Wright's factory offices. The roof outline can still be seen on their wall today. This picture was taken in the 1920s, probably in 1922, when the floods were particularly high. The board shows that Thomas Pike was the licensee and beer was supplied by the Stretton Brewery, based in Derby. 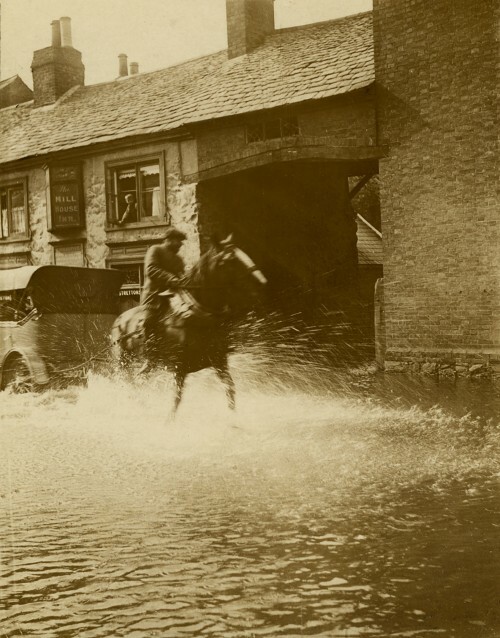 It almost looks as if the horse is pulling the bus backwards out of the floods. There is a boy looking out of the window, watching what is happening.